The Alberta Serious Incident Response Team has been called in. 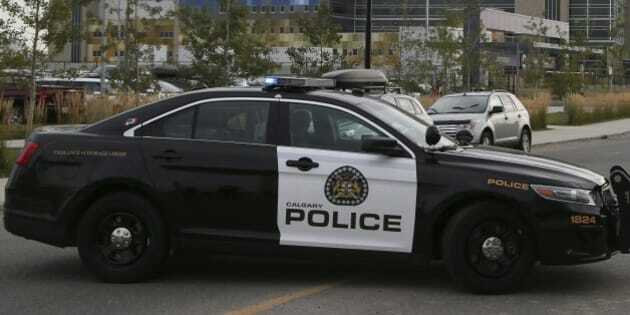 Calgary police have shot and wounded a man after what they say was a deliberate hit-and-run involving a cyclist in the downtown core. Police say no officers were hurt but the suspect was taken to hospital Tuesday with non-life-threatening injuries and the cyclist was in serious condition and undergoing surgery. Police say the suspect also drove his vehicle — a suspected stolen, black SUV — directly at officers when they tried to stop him. One officer had to take evasive action and dive into a police vehicle to gain cover. He narrowly avoided being struck, but the police van was hit by the suspect vehicle and was significantly damaged. That's when another officer opened fire, wounding the suspect. A woman with no injuries was also taken into custody while a third potential suspect remains at large. Police also say they are investigating the possibility of a connection between this incident and a series of violent incidents that occurred throughout the day including attempted car thefts and dangerous driving incidents, involving a number of suspects and vehicles. As is standard practice with all office-involved shootings, the Alberta Serious Incident Response Team has been called in.